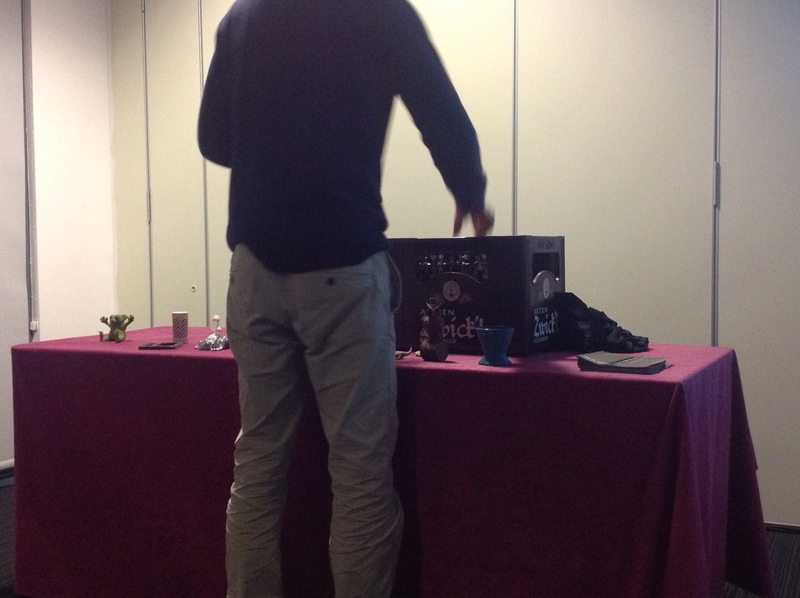 The talk starts with a bang (various pops to be more specific) when the 2 speakers start giving out german beers. And the audience is won over! 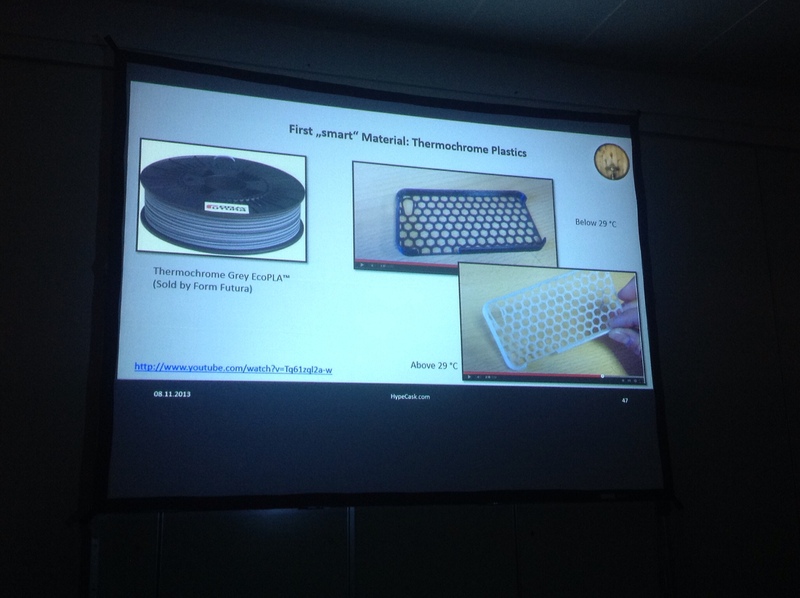 Stephan Weiss starts explaining that the talk will be on the various filaments that can be used for FDM printers, so finally it's all about our low cost 3d printers. 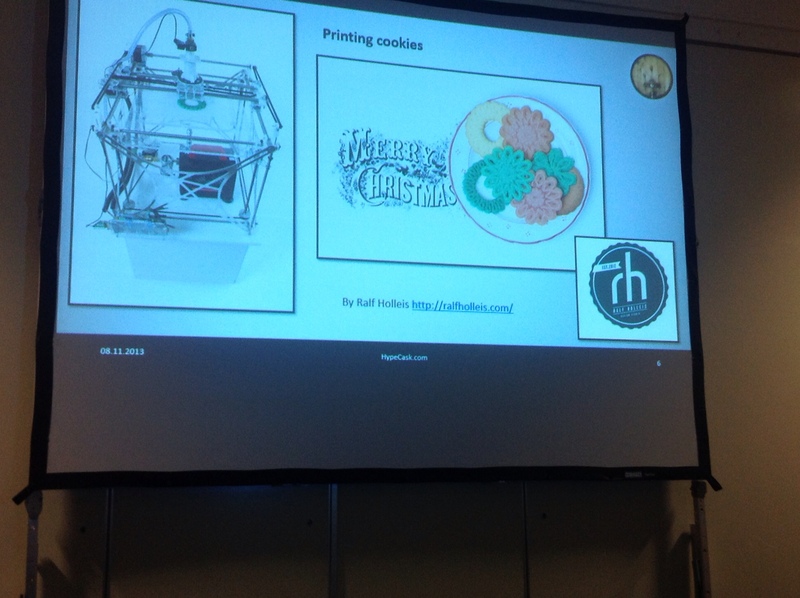 Changing the setup you can use 3d printers to print various pastes like cookies and chocolate, but if you don't want to change the printer you are stuck with termoplastics. So on to the various plastics. 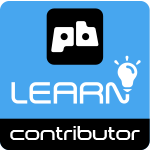 The most common plastics are ABS and PLA so he obviously starts with these materials summarizing the pros and cons. 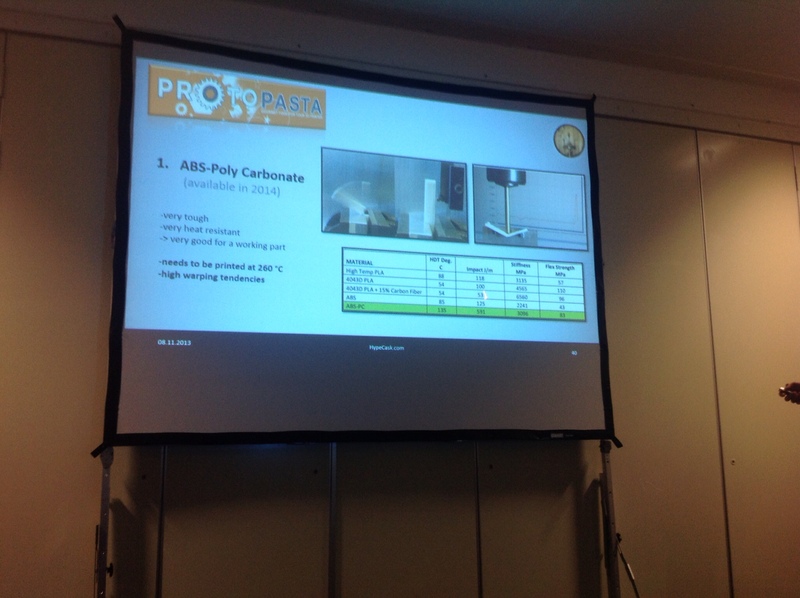 ABS: soluble in acetone, very resistant but oil based so it's polluting and gives off fumes while printing. 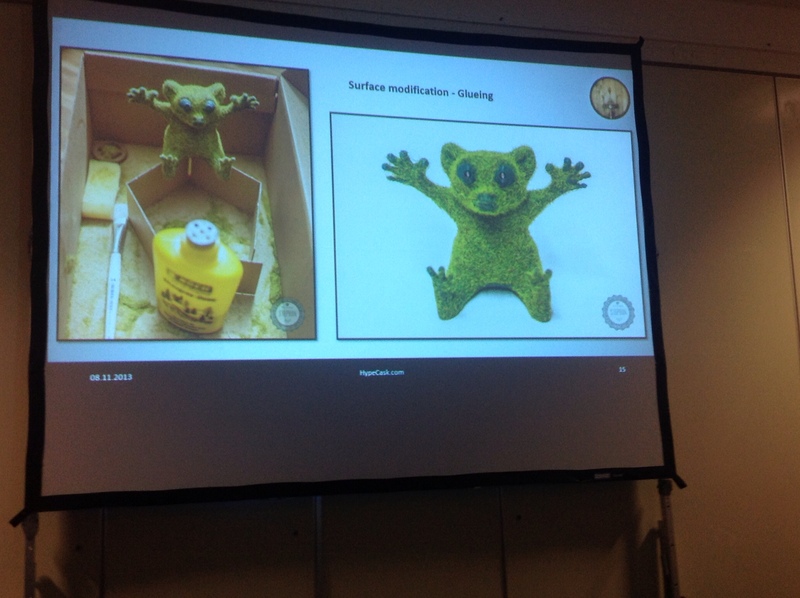 PLA: plant based, little warping and not toxic but it's brittle and can be used till 90*C. Can then be spray painted like the cute little frog. Another possibility to improve the final quality also for PLA and hide the layers is to use glue and stick something on it like fake grass. I have to try! But there is more and the point of the talk is to show how many more materials are available and what could be the uses of all of these. 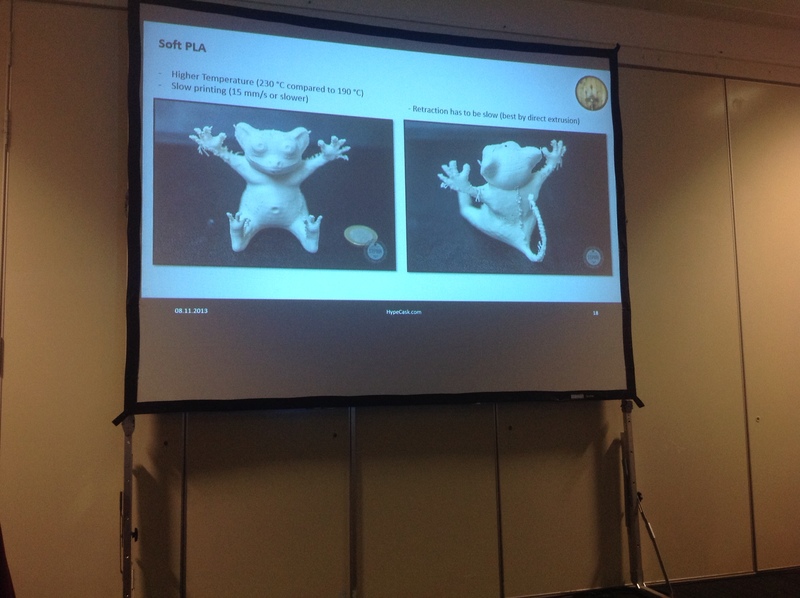 Soft PLA: prints at 230*C compared to 190*C, but slow printing is needed and it's better to avoid retraction. XT: minimum warping, similar to PET, but oil based and hard to dye. The final finish is beatiful because it's crystal clear. 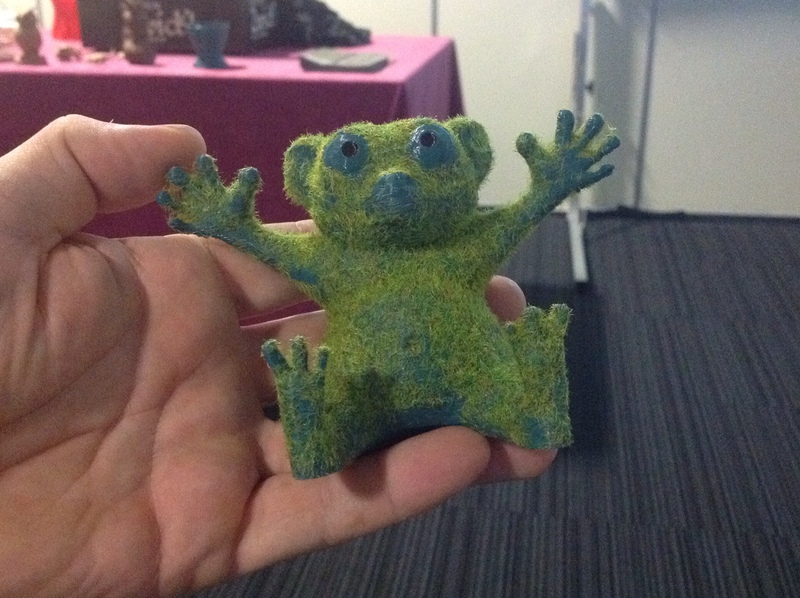 Easy to print, the example passing around is a very big (50cm) sculpture. If treated with acetone it becomes cloudy but looses the layers so it's perfect for casts. In the dishwaher it becomes opaque. It does not stick to PLA so it's good for dual extrusion. Changing the heat temperature of the printer you can have different areas more or less transparent, with nice results with LED lights. LAYWOOD: the first composite material, PLA+40% recycled wood, again changing the temperature during the print you get slightly different colors when the wood burns a little more. On the other hand it's a brittle kind of filament and does not come easily on a spool. 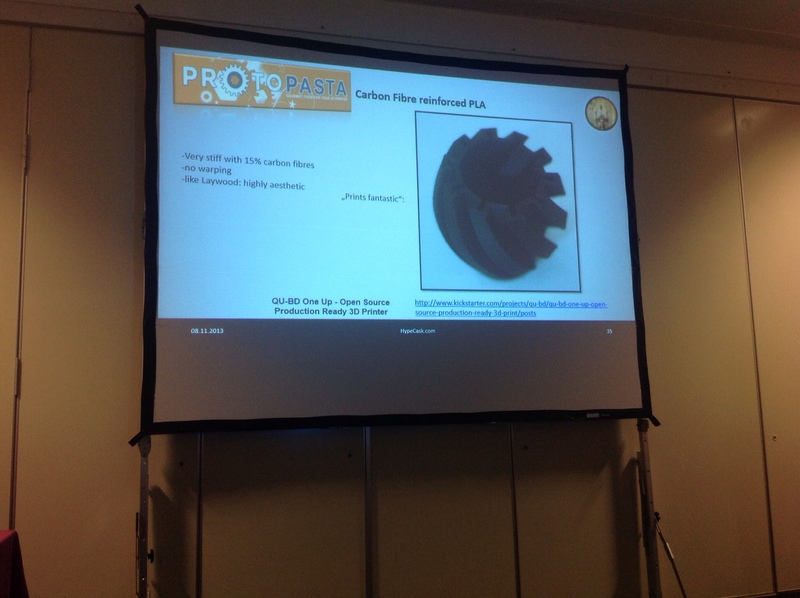 Protopasta, a kickstarter project that Stephan endorses because they are making new filaments and will provide data sheets and probably material sheets with more informations on the risks of printing with each material and instructions. Carbon fiber PLA: If dropped sounds like metal, it's a bit more stiff than PLA but it does not look like plastic anymore and has a very nice feel. This time what counts is not the characteristics of the plastic filament but the impression the finished object does to the public. High temperature PLA: added stuff that makes it crystalizes more so it prints nicely and has similar characteristics as ABS but still being non toxic. POM polyoxymethylen. Used in labs to make gears to replace metals. Printable but releases formaldehyde if heated over 220*C so pretty scary. Teflon: low friction, working temperature of 200*C, it is resistant to chemicals prints at 330*C but again if heated over 360*C it gives off deadly fumes that can really kill you. And the anecdote of their colleague stuck in the hospital for a day after taking a sniff was really unnerving. Perpetual plastic project shows how recycling can be really made by the people that drop by their used cups and then create new filament. And techfortrade is working on having ethical 3d printing material coming from plastic waste giving also an income to people in developing countries. Future materials will probably also be smart materials, like Glow in the dark filament or plastics that change color at different temperatures, useful for temperature sensors and sunscreens. 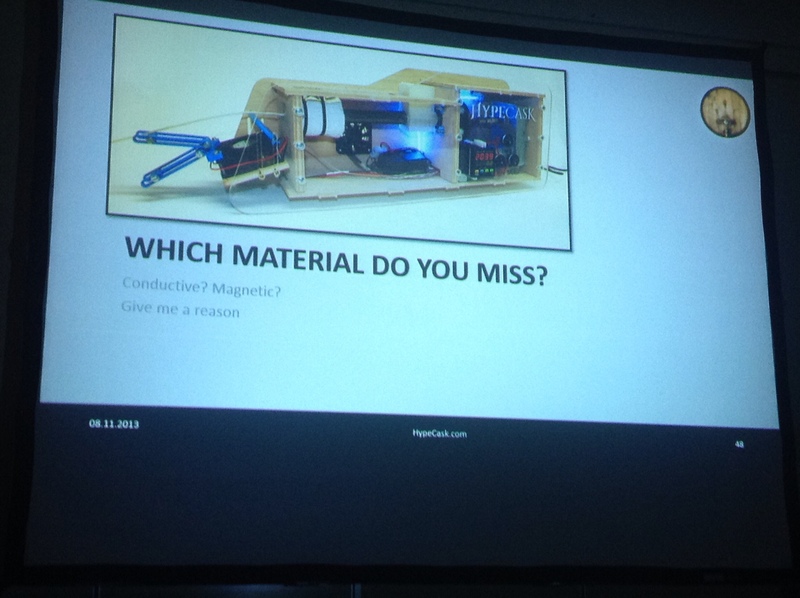 To finish the talk Stephan Talks about the filastruder that really gives us the possibility to make our own filament and give it the characteristics we need, for instance conductive materials or magnetic materials. 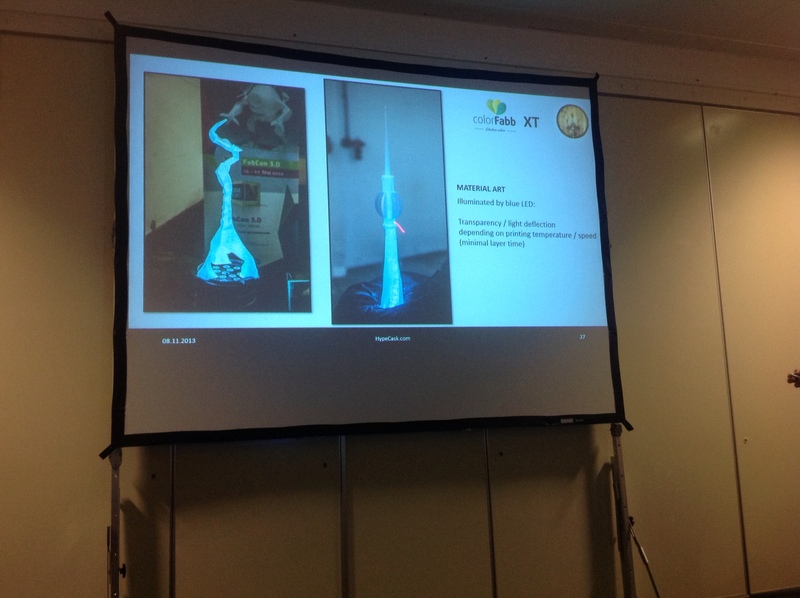 The hint of filament with conductive materials strikes a lot of interest in the public with people imagining how to use it and also someone who knows of a firm that already sells it. A curious note on past experiences from the various shows to which Hypercask participated: a heavy material is considered more valuable, so a hand printed hollow and filled with sand during the print gives another sensation to who touches it and finds it heavier than he thought. 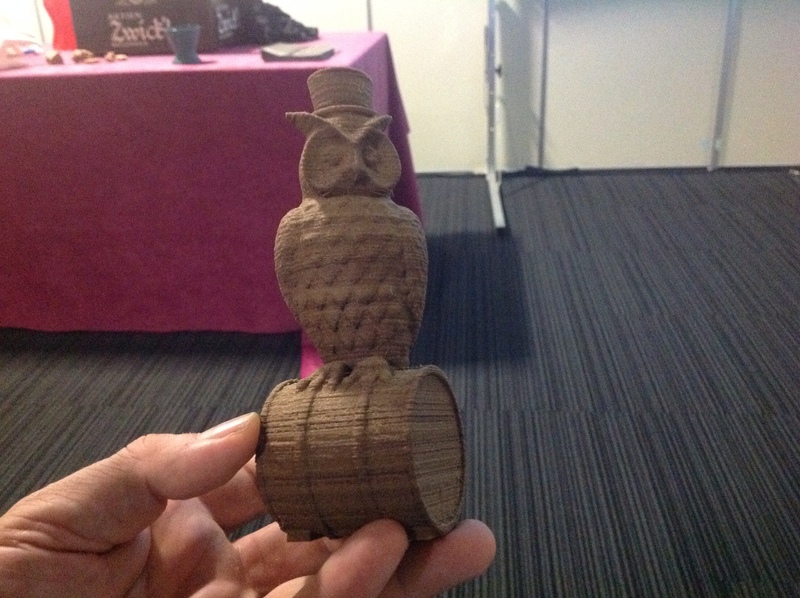 This entry was posted in events and tagged 3d workshop, 3dprintshow. Bookmark the permalink.